I went to T.H.E. Show in Newport Beach for the waters, but…I was misinformed. The waters of the Pacific Ocean are a seventy-dollar round-trip cab ride from where T.H.E. Show is actually located, which is in a fourteen-story hotel in an industrial park in Irvine (or “Ir-veen,” as one of the receptionists at The Hotel Irvine called it). Of course, I can understand the misnomer. I mean, how many people are gonna get all worked up about going to “T.H.E. Show in Irvine/veen”? Though I’d heard that “Newport Beach” was great sounding, you couldn’t have proved it by my first day at T.H.E. Show. Everything sounded dark and various shade of lousy. However, while darkness remained an enduring theme, the quality of the rooms picked up on Saturday and Sunday, and I left thinking that T.H.E. Show was decent sonically (or “sone-ically”). As virtually every exhibit at T.H.E. 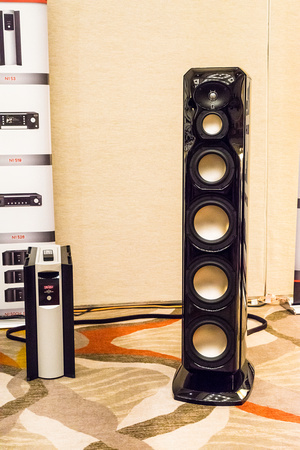 Show was in my category—loudspeakers $20k and up (a little wrinkle we’re gonna have to do something about next time I go to Irveen)—this show report is long, even by my standards. While it is as complete as I could make it, there are undoubtedly rooms I missed and prices/facts/names I’ve gotten wrong. I can only reiterate that I’m just one guy with a briefcase full of blues (and classical and jazz). Though I did enjoy the company of Ms. Mullins—who was covering the allied category of electronics $20k and up—we are two, and the show is many. We did the best we could, but apologies in advance for rooms missed or mistakes in nomenclature/pricing. German loudspeaker designer Roland Gauder’s $60k five-driver, three-and-a-halfway Gauder Akustik Berlina RC-7 Mk II floorstander—with its ribbed enclosure, 50dB/octave symmetrical crossovers, and custom-built Accuton ceramic and diamond drivers—made my Top Five in Munich driven by Vitus electronics, and it made it again here in Newport, this time driven by Accuphase’s A-70 Class A stereo amplifier and C-2820 linestage preamp, and Air Tight’s ATE 2005 phonostage, sourced by a Hanss T-60SE turntable with Durand Kairos tonearm and Air Tight PC-1S cartridge, and cabled by PranaWire. If the bottom line of a stereo system is how successfully it conjures up a lifelike semblance of real vocalists and musicians, then the Berlina RC-7 was one of the three most lifelike systems at Newport Beach. No, the Gauder doesn’t have the astounding dynamic range of a horn system like the Cessaro Wagner; nor does it reach as deeply into the bass as my Magico M Pro/JL Audio Gotham system at home; nor it is quite as seamlessly of a piece as the single-driver Voxativ 9.87. 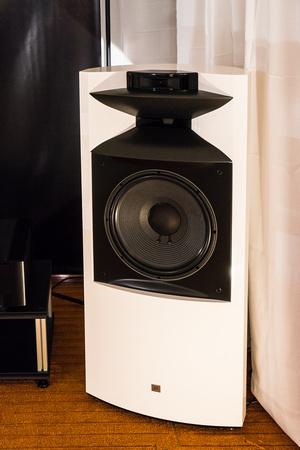 But…it is dynamic, deep reaching, superbly defined, and seamlessly neutral and transparent enough to make everything from Peter, Paul & Mary to the Talking Heads to El Vy sound uncannily “there.” Just a great loudspeaker—and a great system. Jeff Catalano of High Water Sound had an exceptionally good show with Cessaro’s new $65k Wagner spherical-horn-loaded two-ways driven by TW-Acustic’s 300B monoblock amplifiers, RPA 100 linestage preamplifier (later replaced by an MBL because of “technical difficulties”), and RPS 100 phonostage preamplifier, sourced by a TW-Acustic Black Knight turntable with TW 10.5 ‘arm and Mijayma Labs Mandrake cartridge, and cabled with Zen Sati wire. This was the best horn system I heard at a show that, to my surprise, rivaled Munich for high-quality horn loudspeakers. Though limited in the very low bass, the Wagner was absolutely granitic from the midbass through the treble, with no shoutiness or cupped-hand coloration I could detect. Though the Wagner didn’t show its best at lower volumes, when the sound was turned up—on, for example, Julie’s El Vy Return to the Moon LP or my Talking Heads’ Stop Making Sense—the system was simply terrific because of its uncannily natural dynamic range. To hear the shout of one of the backup singers on El Vy’s “I’m the Man to Be” sound like a real shout—rocket-propelled, completely uncompressed, and yet without any edge or bite—is to hear something that you generally only hear on reel-to-reel tape or in life. Like the seamless Voxativ one-way or the superbly neutral and natural Berlina RC-7, the Wagner brings something to the audio table that is so much like the real thing that it makes the speaker stand apart from other very worthy contenders. 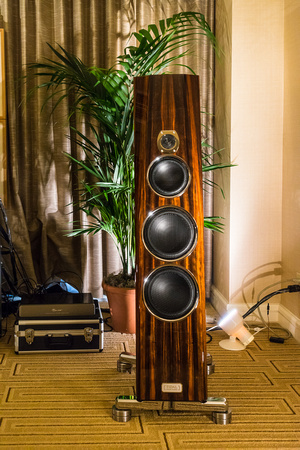 This was the best presentation of a Cessaro loudspeaker I’ve experienced. 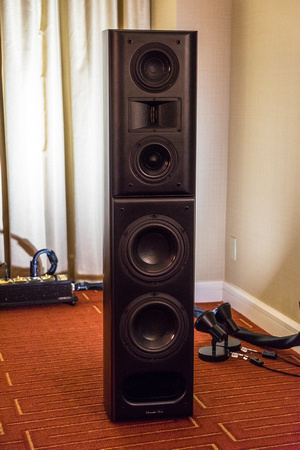 My third best sound of Newport Beach was Holger Adler’s $34.9k Voxativ 9.87 one-way (using Voxativ’s AC-4x spruce-wood-cone driver with neodymium magnet and whizzer tweeter in a folded-horn enclosure, which sits atop an active 12" dipole bass “extender”). Driven by Voxativ’s 845 SET monoblock amps and Ampeggio preamp, and sourced by Totaldac digital, this German masterpiece couldn’t be more different than Cessaro’s horns or Gauder’s steeply crossed-over multiways (both also from Germany, as it turns out), but its sound was, in its own way, just as fascinating and just as realistic. Neutral and absolutely seamless, the 9.87 (along with Voxativ’s Ampeggio Due) is simply the fullest-range, most natural-sounding one-way (or augmented one-way) I’ve ever heard. And once you’ve heard a speaker without a crossover that is this good, it makes everything else sound just the slightest bit cobbled together from parts. No, you’re not going to get the dynamic range of a horn speaker from the 9.87, nor quite the same resolution or treble extension that you get from the Gauder, but what you are going to get is true point-source imaging and a sound that doesn’t change a jot in timbre from octave to octave. My fourth best-sounding room was, believe it or not, digital only. Tidal’s gorgeous $59.9k Contriva G2 three-way (diamond tweeter, black ceramic cone midrange, and twin black ceramic cone woofers), driven by Tidal’s Preos-D preamplifier and Impulse Dual Mono amplifier, sourced by Lampizator digital, and cabled by Dynamic Design, sounded very, very natural on a Jenna Mammina cover of Chris Isaak’s “Wicked Game.” Ditto on a live recording of Valerie Joyce. Open, energetic, neutral, and finely detailed, the Contriva was right up there with the Gauder Akustik Berlina RS-7 for realism (not a trace of the bottom-up darkness that was epidemic at this show), though it was, naturally, a bit flatter in aspect than the analog-sourced RS-7. Of course, I wish I had been able to hear my LPs with the Contriva, but, even at that, this was a Best of Show Contender. As was the case in Munich, I’m in a bit of a quandary about my fifth pick. There are, once again, several very worthy contenders (the Von Schweikert VR-55 Aktiv driven by Constellation electronics, the YG Acoustics Sonja 1.2 driven by MSB electronics, the Raidho D-4.1 driven by Aavik electronics, the Stein Music V6 driven by Stein electronics, the Vivid Audio Giya G2 driven by Luxman electronics, the German Physiks HRS-130 driven by Merrill electronics, the Burwell and Sons Mother of Burl horn-loaded loudspeaker, the Vandersteen Model 7 MkII driven by Vandersteen electronics, the Lumen White White Light 25th Anniversary driven by Ayon electronics), but I’m gonna settle on the $50k Marten Mingus Quintet, driven by EAR 509 monoblocks and an EAR 912 preamplifier, sourced by a Helius Viridia turntable (with Helius Omega Silver Ruby ‘arm and Kiseki Purpleheart cartridge), and cabled with Jorma Prime wire. Frankly, it was a very close call between this system and the Vandersteen, as both sounded extremely realistic (and very much alike) on my PP&M and Deano LPs. I went with the Marten because it had a slightly smoother presentation and more life-sized imaging (particularly when it came to image height). 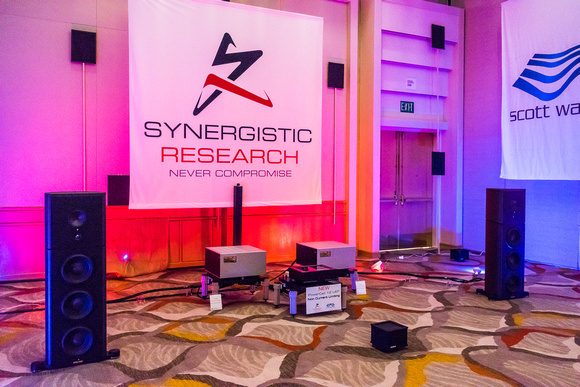 Von Schweikert Audio showed its three-way VR-55 Aktiv (with built-in, powered, transmission-line-loaded subwoofer) powered by Constellation electronics, wired with Masterbuilt cables, and supported by Critical Mass Systems stands. The room was digital with a tape deck—so I couldn’t try out my LPs—but it impressed me nonetheless. 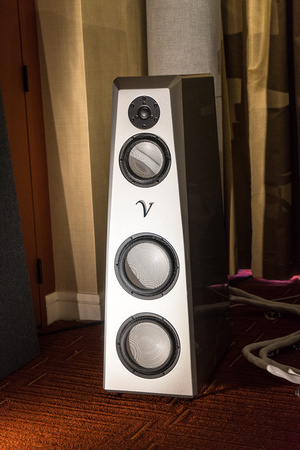 I liked the VR-55s very much at AXPONA Chicago, and they sounded just as lovely in Newport on a recording of “I Love Paris,” with good detail and color, albeit also with a slight thickness in the midbass. On a second visit a solo piano recording of Yoram Ish-Hurwitz playing Liszt was beautiful, full, and powerful, though still a bit dark in balance. The system really picked up when tape was played back, sounding altogether superior on reel-to-reel—not nearly as dark though a bit constricted in width and depth because of the unusually narrow room. Although I wish there had been a turntable to listen to, this was still a Best of Show contender. Philip O’Hanlon of On A Higher Note had yet another great outing with Vivid Audio’s $50k five-driver, four-way Giya G2 floorstander with its twisty, tapered-tube, fiberglass cabinet, driven by Luxman B-1000f monoblock amplifiers, C-700u linestage, and EQ-500 tube phonostage, sourced alternately by a Luxman PD-171AL turntable (with SME M209R tonearm and SoundSmith Hyperion cartridge), a SonoruS 1/4" reel-to-reel tape deck, an Otari 1/2" reel-to-reel tape deck, and Merging Technology digital, and wired with Shunyata Research cables. O’Hanlon treated listeners to a feast of sources, starting with two two-mike digital recordings (made by Mark Levinson) on CD (both of which sounded a little dark in timbre with superior transient response and excellent instrumental texture), followed by an LP of Lori Lieberman (slightly dark timbre again but still natural with really good resolution), followed by 1/4" two-track tape of Vanessa Fernandez (which produced an immediate increase in density of color and bass extension, richness, and power but had the tube signature of the SonoruS deck), followed by 1/2" two-track of Muddy Waters on the Otari studio deck (no tube signature here but great power and transient response, though Muddy sounded, as he usually does, as if he and his guitar were clipping the mic preamps occasionally), and finishing with a quad-DSD file of the first movement of the Mahler Third Symphony (tremendously powerful and bitingly incisive but with the usual digital broken-glass treble and without the power range richness of tape or vinyl). A fascinating and impressive demo—and very close to a Best of Show. Wilson Audio showed its $111.2k four-way Alexx floorstander again, this time with VTL Siegfried Series II amps, VTL TP-6.5 phonostage, and VTL TL-7.5 Series III linestage, sourced by a Grand Prix 2.0 turntable (with Triplanar tonearm and Lyra Etna cart), and wired with Transparent Opus cables. On my LP of the Enescu Romanian Rhapsody No. 1, the system sounded extremely rich, smooth, and lovely, though a bit lacking in dynamic spark (odd for a Wilson speaker). The Alexx was once again just a little polite dynamically on my PP&M and Talking Heads LPs (on Chris Franz’s lightning-strike drumming, for example, from Stop Making Sense), though octave-to-octave coherence was simply wonderful and tone color was never less than gorgeous. Though it didn’t have the very lowest bass in this room, in Newport Beach the Alexx showed promise of being one of the all-time-great Wilsons. Carl Marchisotto’s $19.8k Nola Studio Grand Reference Gold sounded very alive dynamically and quite neutral driven by VAC electronics and wired with Nordost cable. Though lacking a little presence on my Dream with Dean disc, the Nolas made Dean sound, as he should, like a baritone rather than a bass; they also offered excellent reproduction of his distinctive articulation and breath control (or lack thereof). Driven by Levinson electronics and sources, JBL’s $65k Project K2 S9900 “augmented two-way” horn-loaded floorstander sounded simply terrific on a Fairfield Four recording in a smallish, all-digital room, with wonderful presence and dynamics on voices (though their timbre was—you guessed it—a bit dark). I don’t know how JBL does it, but its speakers manage to achieve an excellent blend of an Alnico-magnet-powered cone woofer with a horn-loaded compression-driver mid/tweet and a horn-loaded beryllium-driver super-tweet. The presentation was as good in Newport Beach as it was in Munich. This is a wonderful horn loudspeaker, and a personal favorite. 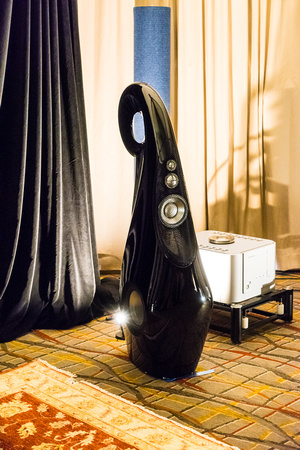 Speaking of superb horn loudspeakers and personal favorites, Avantgarde Acoustic was showing its new $34.6 spherically horn-loaded Uno XD (with powered SUB225 XD subs), which offers user-adjustable crossovers for each driver and DSP room correction. Driven by Audiopax amps and a D’Agostino phonostage and sourced by a Bergmann turntable, the Uno XD sounded very detailed on Deano (superb reproduction of vibrato), with outstanding dynamic range and not a hint of excess sibilance or cupped-hands coloration. Like so many other exhibits at Newport Beach, the Avantgardes may have been a little dark in timbre but they were also very realistic. The $45k horn-loaded Natural Sound 1 loudspeaker (from Natural Sound Europe), which uses Maxsonic field-coil drivers from Japan, was being driven by top-end Audio Tekne tube electronic from Imai-san, and sourced by a Vertere turntable and My Sonic Labs cartridge. On my Deano disc, the system was absolutely gorgeous and very detailed—a little dark in balance, like almost everything else, but still ravishingly beautiful with excellent bass. After hearing this system, I noted that “horns are having the best of it at this show.” And so they were. In passing, it is a very great pleasure to welcome Audio Tekne’s Imai-san, whose electronics I have long admired, back to the U.S. market. 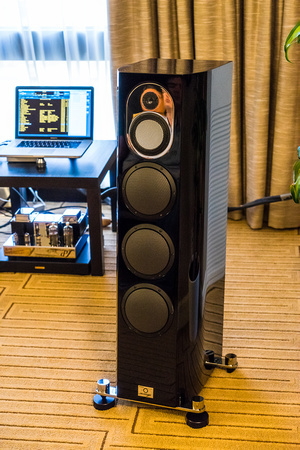 As I noted, the $74.8k Sonja 1.2 driven by MSB electronics and source components, and wired with Analysis Plus cables produced a sound that was very close to a Best of Show contender—warm and rich but (for once) not at all dark, and surprisingly dimensional for digital. The system was really quite superb on a CD of sax, which is an instrument that is hard for digital to get right. 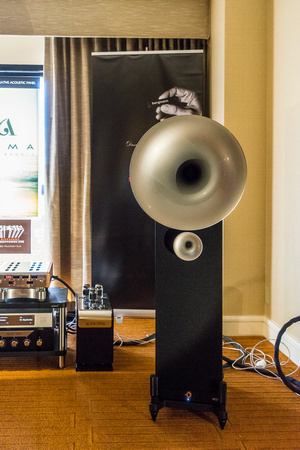 Also flirting with a Best of Show nomination was the $110k, seven-driver, three-way, ribbon/diamond cone Raidho D-4.1 driven by Aavik electronics, sourced by a Thales turntable and tonearm (with EMT JS6 cartridge), and wired with Ansuz cables. In Munich the D-4.1 did not fare well in the glassed-walled cubicles of the MOC, with a bass range that sounded out of control and imaging that was swimmy. In Newport Beach, on Julie’s El Vy disc (which has very low bass), the speaker was extremely well behaved in the bottom end. It did not reach down quite as deeply as my Magico M Pro/JL Audio Gotham system does, but it was quite well defined where it played without any hint of a port bump, and with the usual superb color, speed, and resolution of Raidho’s ribbon/diamond cone midrange/treble. Image focus was pinpoint, too, with terrific stage depth and width. Just a much much better showing for one of the world’s great loudspeaker marques. Another BOS contender (and a perennial one), the $62k Vandersteen 7 Mk II with active subwoofer, powered by Vandersteen M7-HPA monoblock amps, Audio Research Reference 10 linestage and Reference 10 Phono preamps, sourced by a Basis Audio Work of Art turntable with Basis tonearm (and Lyra Atlas cartridge), and wired with AudioQuest cable, sounded superb on PP&M with great separation of voices, extremely natural timbre, and exceptional resolution (Paul’s sometimes harder to hear vocal and guitar lines were outstandingly clear). Talking Heads was also pretty damn good. At its best this speaker is just plain realistic, though it tends to reduce image height, probably because the drivers in their smallish enclosure sit close to the floor. Also very much a contender, German Physiks showed its $22,750 HRS-130 with carbon-fiber Dicks Dipole Driver coupled to a new 10" woofer, driven by Merrill Audio electronics. Dark and sweet in tone color, the HRS-130 had a boxless three-dimensionality that made for a great disappearing act on my Taj Mahal LP. This was, by far, the best I’ve heard any German Physiks speaker sound at a trade show. 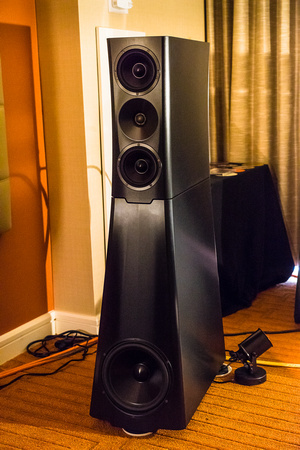 Sourced wirelessly by $1.5k worth of Questyle’s electronics, the $20k Focal Sopra 3 three-way floorstander (in articulating cabinet) sounded surprisingly terrific—rich, lively, with an analog-like roundedness. A definite for-the-money contender (because of the affordable Questyle electronics), this was the best wireless demo I’ve ever heard. 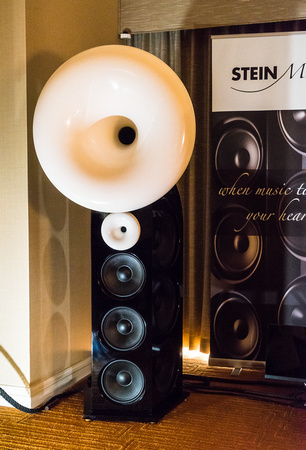 Famous for its room treatments, Stein Music introduced its $80k V6 floorstander with spherical-horn-loaded tweeter and midrange, cone mid/bass, and active, DSP’d woofers that are side-mounted. This large, striking-looking transducer was driven by Stein electronics and wired with Stein cables. The room was digital-only, alas, but that didn’t prevent the V6 from coming close to a Best of Show award. On The Weavers’ “Guantanamera,” it was superbly natural on all three voices (with zero horn coloration), gorgeous on guitars, and extremely high in resolution (I could hear Seeger humming as he played, which is almost a first). A BOS contender. 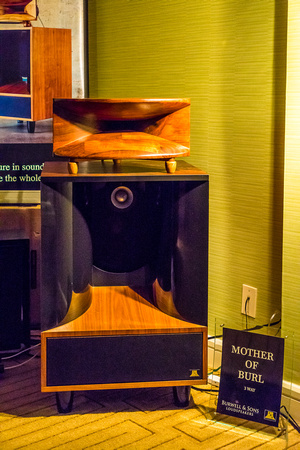 Burwell & Sons debuted its wittily named Mother of Burl three-way horn-loaded loudspeaker. As I’ve already said, this was very good show for horns and the Mothers of Burl did not disappoint, sounding very lively and open with neutral-to-light balance on digital and no obvious horn coloration. These giant things showed very natural timbre and superb dynamic ease on my PP&M LP (with exceptional resolution of Mary’s voice on “Don’t Think Twice”). On top of this the Mothers were well defined and pretty extended in the bass. Another BOS contender. Thrax demo’d its two-way Lyra MTM module with horn-loaded tweeter sitting atop a Bassis active subwoofer with built-in crossover. The entire package costs $60k. The Lyras were powered by Thrax’s Teres monoblocks with tube inputs and MOSFET output, and sourced by a Döhmann Helix turntable. On my Dream with Dean disc, the sound was very dark—Deano sounded like a bass rather than a baritone—with what seems like a roll on top and some suckout in the midrange that added a distinct cupped-hands hollowness to Martin’s voice. There was also a slight upper-midrange spittiness riding on top of vocal. Not a good showing for Thrax, etc. 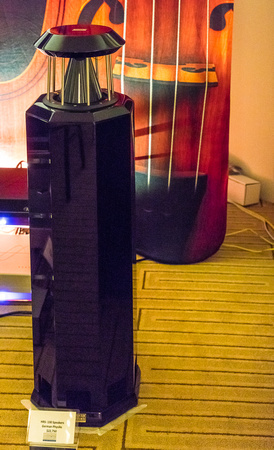 Perfect 8 Technology $100k The Point ribbon/cone, glass-enclosed semi-dipole with powered bass modules was driven by BAlabo electronics and sourced by a Bergmann turntable. I’ve very much like The Point in the past, but this was not a sound that I recognized from previous shows—darker, richer, and “prettier” than what I’m used to from Perfect 8. My Dream with Dean LP was close to superb on Dean’s voice, but the powered woofer was a little heavy on standup bass (I thought the woof needed to be dialed back a bit) and the ribbon tweet was a little aggressive on fff. Peter, Paul & Mary sounded pretty much the same as Dean—dark and lovely but not at all realistic (and these speakers are capable of sounding very realistic, as is this superb reissue). Driven by Audionet electronics, sourced by a Kronos turntable, and wired with Kubla-Sosna cable, the YG Acoustics $72.8k three-way Sonja 1.2 with YG’s BilletCore and ForgeCore aluminum drivers sounded very much like the Perfect 8’s on my LPs—dark and beautiful. PP&M’s voices on “All My Trials” were simply gorgeous, with superior definition on Paul’s vocals. But, once again, the sound was not realistic on this eminently realistic disc because of a slight darkness on top and a bit too much fullness in the bass and midbass, which tended to make the Paul’s casket-bodied guitar (Sebastian) sound muddy. This was not as superbly lifelike a presentation as I heard from this same system at AXPONA Chicago. 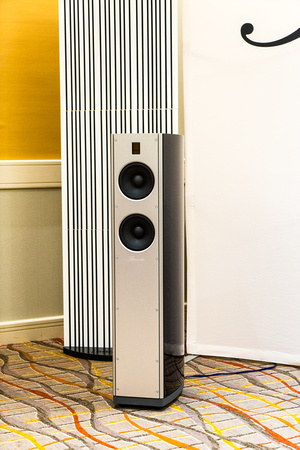 Magico S7s, driven by Soulution monoblocks and wired with Synergistic Research Galileo 2 in a room outfitted with Ted Denney III’s various room treatments, made a huge sound with an astonishing abundance of air, though the bass was muddy even with Ted’s tuning box in place. I wasn’t able to listen to my LPs in this room, but the presentation was kind of amazing on a Roger Waters cut, with such tremendous spatiality that Waters appeared to the outside and way in front of the left speaker, as if his voice were emanating from the side channel of a multichannel setup—quite remarkable from a “wow-me” standpoint. Alas, there was way too much low end on a big orchestral Hans Zimmer recording. Once again, this was not a realistic sound, though it was, in its own way, a startlingly impressive one. Unfortunately, Analysis Audio was having trouble with its VPI Avenger turntable equipped with SoundSmith’s strain-gauge cartridge (the ‘table was “doing some funny things” when it came to maintaining proper speed). As a result Analysis’ $22k Omega full-range ribbon/planar did not come close to achieving the realism I expected from my PP&M disc. 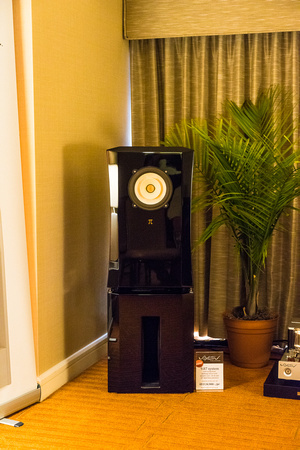 Acoustic Zen’s $22k five-driver Crescendo floorstander with horn-loaded ribbon and cones driven by Metaxsas and Ypsilon electronics, and sourced by a Thales turntable sounded kind of thick and congested with no really deep bass on Julie’s El Vy disc. On the darkish side in balance, it lacked stage depth and width. Ampsandsound’s $30k, tractrix-horn-loaded three-way, the Hudson, driven by the company’s own 300B amplifiers and a McIntosh C-22, had a very pleasant sound on Julie’s El Vy disc, though the bass may have been a bit disconnected and didn’t really go low (maybe 60 or 70Hz), though it had nice snap on drums in the upper bass. “Like teaching a gorilla table manners” was the witty way the fellow in the room described taming a horn’s excesses. Given the overall smooth midrange (no cupped hands coloration), I’d say he did a decent job of it. 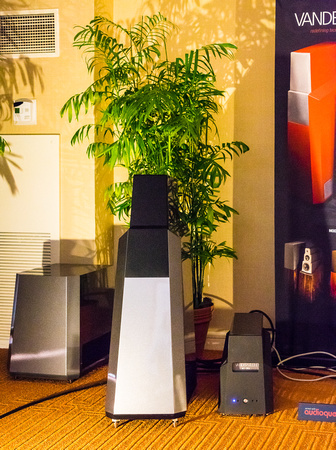 The $29k Vandersteen 5a Carbon with Aries Cerat electronics sounded dark, smooth, and a bit homogenized in a digital-only room—not my cup of tea, but quite pretty. Also in a digital-only room, Tidal’s $22.8k three-way Piano G2 with Reimyo electronics made a lovely, dark, precise, and attractive sound with CD—quite beautiful, actually. 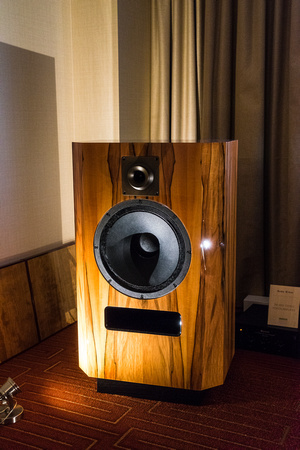 Driven by Angstrom electronics Diesis Audio’s $20k Aura with horn-loaded tweeter and dipole woofers had, I’m afraid, a classic hooded, cupped-hands midrange. 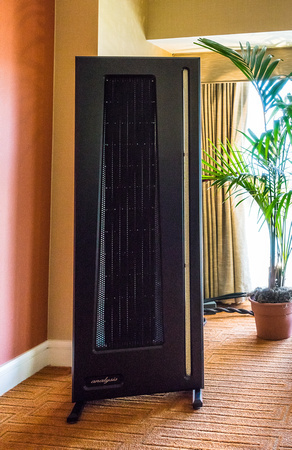 Burmester showed it $35k BA31 aluminum-enclosure floorstander driven by a Burmester 111 server/preamp and Burmester amp. Very neutral on both Hugh Maskela’s Hope and Take Five, it sounded controlled and precise but not particularly lively. 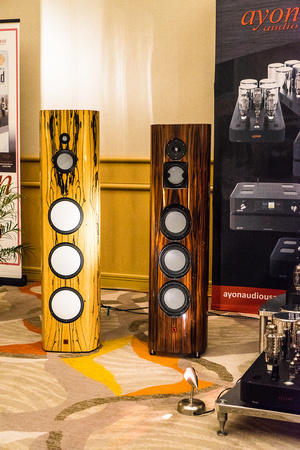 Acoustic Zen’s Maestro powered by Ypsilon electronics and sourced by an Aurender server had a nice showing—with a sweet treble and highly resolved midrange that produced nice bite on brass and lovely wind tone. 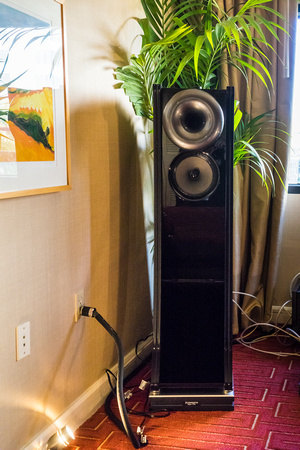 Ocean Way’s $31k Sausalito three-way, driven by Viola electronics, sounded particularly dark and sweet—unusual for Ocean Way, which is typically more studio-monitor-like aggressive. The $22k Revel $22k Salon 2 driven by Levinson electronics and wired with Clarus cables made a big, quite dark, and very spacious sound in a huge ground floor room. 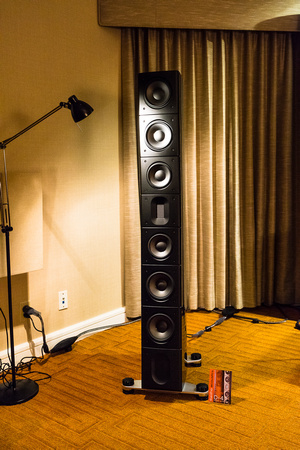 Driven by its own electronics, Gamut’s $20k RS3 two-way stand-mount sounded very smooth and natural on PP&M’s voices with excellent separation and resolution and not a trace of the analytical. 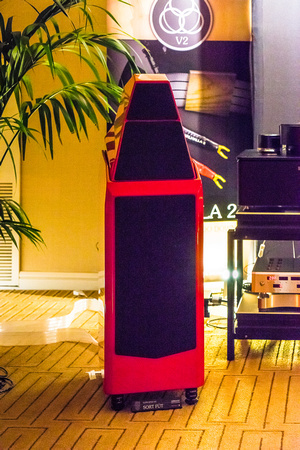 YG Acoustics’ $24.3k Carmel 2 two-way stand-mount, driven by Mola Mola and wired with Kubla-Sosna sounded dark, hard-hitting, and solid in an all-digital room. MBL’s classic 101 E Radialstrahler, driven by MBL’s new Noble amplifiers and other MBL electronics, sounded open and dimensional, of course, but lacking in immediacy and dynamic punch. This was not the sound I’m used to from MBL. A three-way tie among: 1) Gauder Akustik’s Berlina RC-7 Mk II driven by Accuphase’s A-70 Class A stereo amplifier and C-2820 linestage preamp, and Air Tight’s ATE 2005 phonostage, sourced by a Hanss T-60SE turntable with Durand Kairos tonearm and Air Tight PC-1S cartridge, and cabled by PranaWire; 2) Cessaro’s $65k Wagner spherical-horn-loaded two-ways driven by TW-Acustic’s 300B monoblock amplifiers, RPA 100 linestage preamplifier, and RPS 100 phonostage preamplifier, sourced by a TW-Acustic Black Knight turntable with TW 10.5 ‘arm and Mijayma Labs Mandrake cartridge, and cabled with Zen Sati; and 3) Voxativ’s 9.87 augmented one-way, driven by Voxativ’s 845 SET monoblock amps and Ampeggio preamp, and sourced by Totaldac digital. 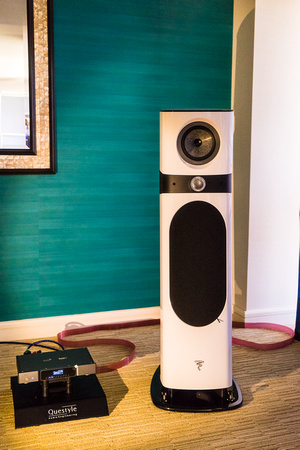 Focal Sopra 3 driven (wirelessly) by Questyle electronics. A tie between the Lumen White White Light 25th Anniversary and the Stein Music V6.